Here is a men’s 3/4 length double sleeve and chest koi tattoo in black, red, and yellow with an abstract look to it. 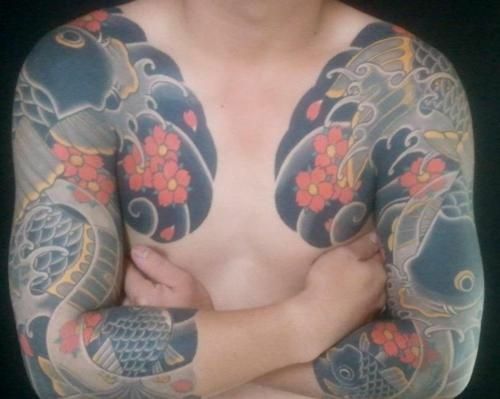 Japanese style koi tattoos are great for sleeves and other large areas because this type of art traditionally uses a lot of flowers, waves, and other patterns along with the carp. You can easily design an image that will flow together to fill up space on the body. This one also has a ribbon like design that winds from his forearm to his shoulder. The tattoo is of two ¾ length sleeves that curve around the chest area. There are multiple fish in varying sizes that are drawn in a slightly abstract way. These fish also have more emphasis than usual on their eyes with their large size the yellow rims. The background is all black with white and grey waves curling up and around the tattoo. Bright red and yellow flowers break up the greys and blacks and tie together the yellow detailing of the carp.